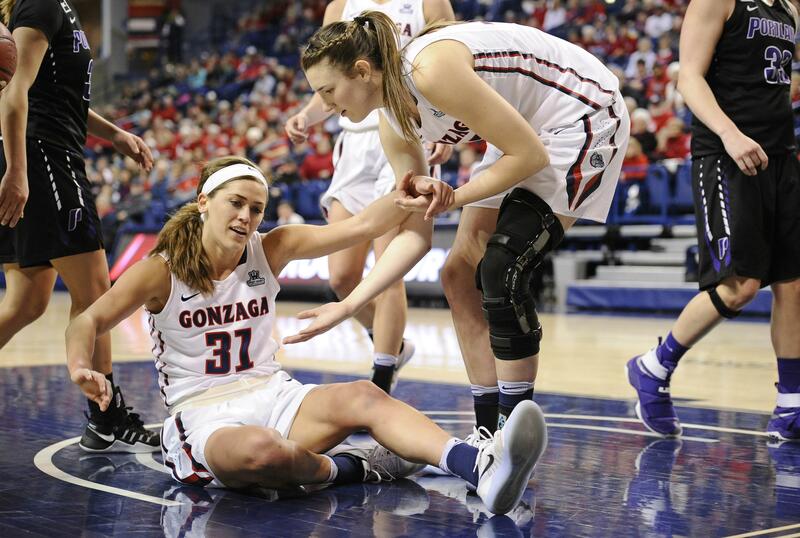 Sat., Jan. 7, 2017, 11:10 p.m.
Senior guard Elle Tinkle scored 16 points and sophomore Jill Barta added 10 to lead Gonzaga over the Portland Pilots 67-55 at the McCarthey Athletic Center on Saturday, giving the Zags their second straight win in conference play. Unlike Thursday’s matchup against the Dons when the Zags (11-4, 2-2 West Coast Conference) struggled to score in more than four minutes into the game, GU managed to get on the board first Saturday in less than a minute. But that first score didn’t come any easier. Tinkle tossed up a 2-point shot and hit nothing. Senior Kiara Kudron grabbed the ball out of the air and put it up to the rim, but missed. Barta grabbed the rebound and went for a layup, but missed. Kudron got herself right back in tussle, grabbing the rebound and finally laying the ball in the net. That first minute certainly set the tone for the rest of the afternoon. GU consistently struggled at the rim, but the Bulldogs’ ability to recover the ball quickly kept them alive. The Zags shot only 23.5 percent (4 of 17) from the field in the first quarter, as opposed to Portland which made 38.5 percent (5 of 13) of its field-goal shots. GU’s 15-12 lead at the end of the quarter was the direct result of pulling down boards at both ends of the court. Gonzaga outrebounded the Pilots 16-8 in the first, including nine offensive rebounds that gave them seven second-chance points. Portland (3-12, 1-3) capitalized on GU’s further struggles at the rim in the second half. The Pilots went on a 12-5 run in the first five minutes of the third quarter, which included back-to-back 3s, to tie the score 37. Kudron put GU on top again with two makes at the free throw line. Tinkle followed with her own 5-0 run that kept the Zags up for good. The Zags outrebounded the Pilots 42-26 and shot 78.6 percent (22 of 28) of their free throws while Portland only hit two of their five shots at the free throw line. Tinkle shot nearly perfect at the free throw line, hitting seven of her eight attempts. She had six rebounds and scored off one of her two steals. Kudron scored barely missed a second-straight double-double on Saturday with eight points and 11 rebounds. Saturday marked the last of a three-game home stand for the Zags. GU heads to Los Angeles to face the Loyola Marymount Lions on Dec. 12 at 7 p.m. Published: Jan. 7, 2017, 11:10 p.m.